Private company with a capital of € 426.72, registered with the Trade and Companies of Nanterre under the number 784 406 894. You have a right to access, modify, rectify and delete your private information. Please contact BIEM, 20/26 -92200 bld Park Neuilly-sur-Seine FRANCE or send an email to info[arobas]biem.org. 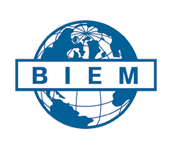 The entire site content is the exclusive property of BIEM and is protected by copyright. Anyone coming in would be contravening prosecute under copyright infringement. BIEM has the right to modify or change at any time and without notice the site and the associated functionalities. BIEM has the right to prosecute any person who would misuse its site.